By Ross Elliott - posted Thursday, 29 March 2012 Sign Up for free e-mail updates! If you believed the tribes of anti-growth neophobes, the idea of growth of any kind in a country so deprived of land as Australia is something that must be resisted. We are short of land and natural resources, the claim goes, and outer suburban development puts too much strain on the natural environment and too many demands on energy, water and other resources. They’re wrong, very wrong in fact and maybe it’s time some of these notions were challenged a bit more. 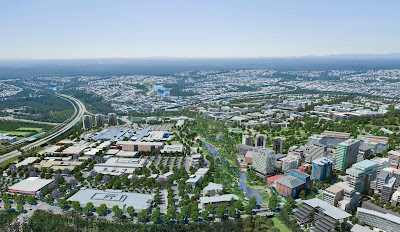 The picture above is a render of how the satellite urban development of Greater Springfield in South-east Queensland might look as it nears completion in the years ahead. It has a way to go, but no one now doubts that it will all happen. Already home to 23,000 people with capacity for around 100,000, the development combines numerous residential communities, a health precinct, education precinct, commercial office and retail in a planned parkland setting over 2,860 hectares. There are other large ‘master planned’ communities planned in the region. The developer Lend Lease has Yarrabilba (just over 2,000 hectares) and Stockland has Caloundra South (3,700 hectares), for example. Other established communities of this nature include Forest Lake (fully developed and now home to over 20,000 people) and North Lakes (currently home to 10,000 people with 25,000 by build out), as well as Kawana on the Sunshine Coast and Robina on the Gold Coast. The first and most obvious thing that can be said of these projects is that they’re popular. Already more than 100,000 people are living in recently developed master planned communities in the South-east corner of Queensland alone, and that will rise to more than a quarter of a million people as existing projects reach completion. Popularity is a sure sign of market success and means these projects are filling a need within the community. Contrast this success with the much debated and much vaunted notion of ‘TODS’ created within existing inner urban environments. A great idea in theory, with many potential positives but why is it that not one has yet been built? Ministers, Mayors and their planning minions have touted TODs as a ‘silver bullet’ solution to growth. With that sort of widespread policy support, you’d expect to see more by now. At the same time, they’ve been far from complimentary about ‘sprawl’ and many have done what they can to resist it and contain it through planning policies (and the courts), yet we see more projects of this nature finding support amongst the community. Maybe there’s a message in that? And contrary to popular myth, this large and growing population of the outer suburbs has not created a congestion snarl of unimaginable proportions, because many of the residents live and work in the same area. Greater Springfield, for example, is talking a job creation target of 30,000 by 2030, and has approval for over 1 million square metres of office space, let alone the jobs in retail, education, health and other areas. The other thing you’ll notice from this picture, and it’s something shared with other projects of similar nature, is the vegetation and landscape cover. Springfield is being built on formerly dry cattle country, previously owned by a paper mill. Much of the land was degraded. Yarrabilba, and much of Caloundra South, are being built on paper mill land much of it covered in a monoculture of commercial pine trees. Forest Lake was built on former military land, once used in part as a US forces base in WWII. Take virtually any of these projects and it is blindingly obvious that the quality of the natural environment, post development, is an improvement on the state of the land before. There is on average more diversity of plant life per hectare of Springfield or Forest Lakes than what was there before, plus there are now lakes and water storage areas, erosion controls and other features that you just don’t find in plantation pine forest. Now consider the odd preoccupation with preserving economically inefficient cane farmland in South-east Queensland. A hectare of cane contains some introduced toads, rats and other vermin. It is sprayed with chemicals. It offers little or no environmental quality. Perhaps its main virtue is aesthetic. I am told one planning report for South-east Queensland some years ago infamously recommended cane land be preserved as a view corridor, I suppose so those stressed out urban executives making their way to Noosa in the comfort of their BMW X5 had something pleasant to look at on the way? Look again at the picture and consider the nature of built form. The houses, shops, offices and community facilities are all (or will be) relatively new. They have been built to higher design codes and feature more energy and water efficient homes and workplaces than have ever been built in the history of this country. Springfield’s shopping centre, Orion Town Centre, is 6-Star Green Star Rated by the Green Building Council of Australia. The office tower (‘Springfield Tower’) has a 4-Star Green Star Rating by the GBCA. The homes are designed for modern lifestyles and for the climate. So the argument that these types of developments are somehow environmentally damaging or wasteful is hard to justify. Under the ground is another story again. What you can’t see are the sewer lines, water mains, electricity supply and data cabling. These are also new. Cheaper to install than retrofitting for higher densities in existing areas, they also offer standards of reliability and connectivity which surpass those of older urban areas. The same story repeats itself in virtually all contemporary new outer suburban communities.